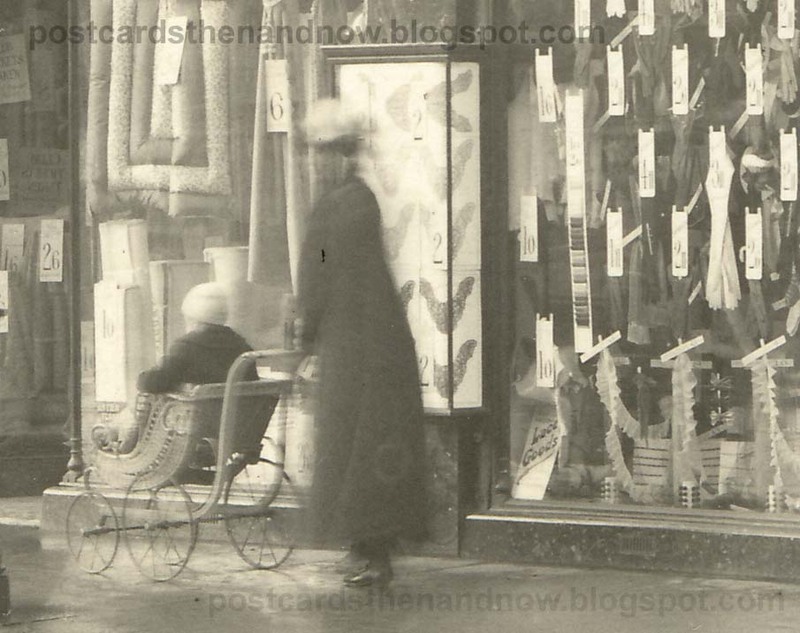 This postcard shows the premises of Thomas Septimus Astill's drapery shop in York Street, Twickenham in about 1912. 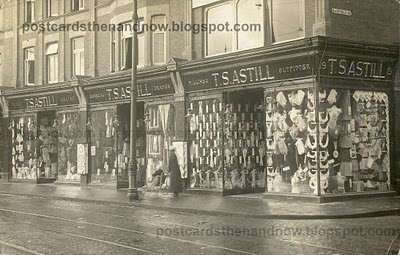 The 1911 Census shows that there were fifteen people living above this shop, all family or employed by Mr Astill's business. 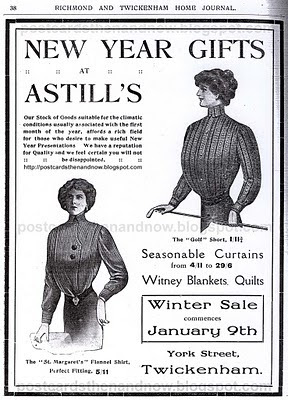 Mr Astill was born in 1872 in Leicestershire. 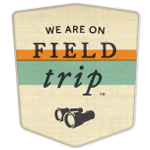 Click on the pictures to enlarge! 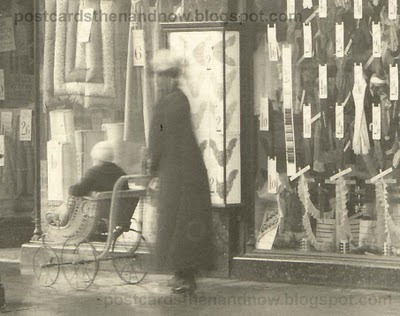 Here is a detail from the postcard, note the amazing basket pram with its flimsy wheels. I cannot think what is being displayed in the box next to the lady, it looks like a selection of false beards to me. 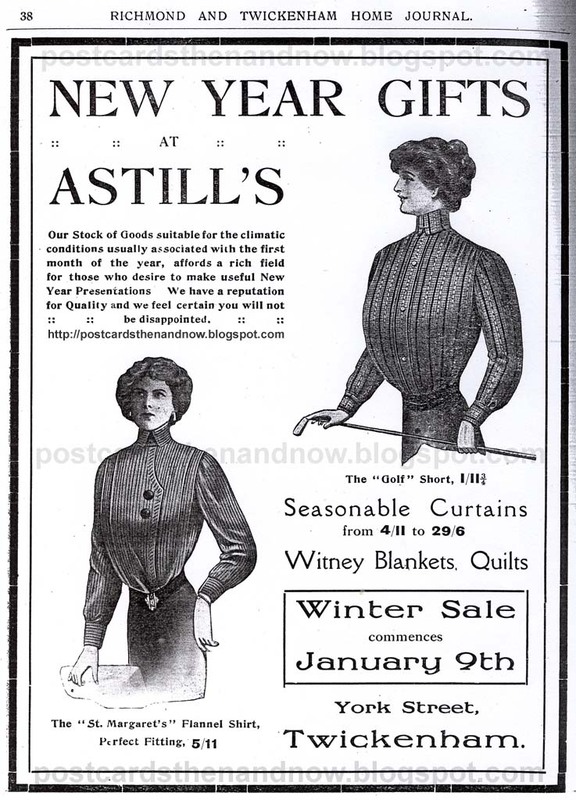 Finally here is a contemporary advertisement for T. S. Astill from about 1912 from the Richmond and Twickenham Home Journal. While the shirts may be magnificent, you can't help noticing that the artist had a very poor grasp of what women actually look like. Howard, I think the objects you are referring to may have been lace decollette to cover the neckline on a woman's dress or blouse. It's very amusing how they just taped everything to the display windows.